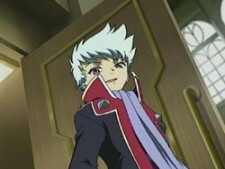 Nagi is the Grand Duke of Artai and Nina's master. In the anime version: He enjoys teasing Mashiro and seems to know exactly what buttons to press to get his way. Upon his first meeting with Mashiro, he asked her if she was the "fake princess of Windbloom." Since then, the two have had a love-hate relationship. He's even had proposed marriage to Mashiro and nearly kissed her except for Arika's interference. His plan is to marry Mashiro and uses her power to rule the world, as a classical villain. For this purpose founds a army of traitor otomes who bear a grudge against Garderobe and the kingdom, where the only exception is Nina, who needs to work for him because she's his otome anyway. Nagi makes Nina and Arika fight each other, but in the end both give up because they're truly friends who love each other. The war stops and one of the last scenes shows us Nagi in the prision. In the manga version: In the manga version, Nagi is truly in love for Mashiro, not knowing that his beloved princess is actually a guy. He is used as scapegoat by the real villain who wants to kill Mashiro-boy and blame Nagi. When Sergay starts his dark plan to kill Mashiro-boy, he traps both Nagi and Mashiro in Garderobe's basement, where he reveals that he plans to kill Mashiro-boy and use the real mashiro princess, who wasn't really dead, as his puppet to rule the kingdom. When Mashiro is attacked, his clothes are ripped and Nagi discovers that his love is actually a boy, however he gives Mashiro his own jacket and says that, for him, it doesn't matter if Mashiro is a boy or a girl, he still loves him. Short after, Sergay kills Nagi and rushes to start a war in the kingdom, while Mashiro, wearing Nagi's jacket, declares that he will stops him. One of the last scenes of the manga shows Nagi and the real princess Mashiro in heaven watching Mashiro-boy and the other otomes having fun.